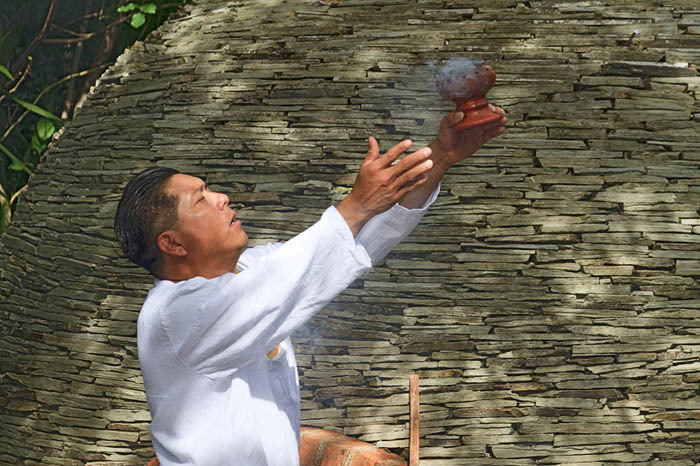 Caption: Maya Shaman greets visitors with ritual smoke from Copal resin. Comments: Maya Shaman greets visitors with ritual smoke from Copal resin. Copal is still used by a number of indigenous peoples of Mexico and Central America as an incense and during sweat lodge ceremonies. Here the shaman and assistants stand in front of a sweat lodge or Temascal (temazcal).